Roxio is labelled as the Digital Media Company from Adaptec, and all of the Adaptec software and updates come from them. The latest version of the CD burning software EZ CD Creator is no exception. I tested the software on two different machines, my home PC (a Pentium II 333Mhz running Windows 98) and my work PC (a Pentium III 900Mhz running Windows Millennium Edition). My home PC was running EZ CD Creator 3.5 (which was bundled with my HP 8100 CD Writer) and Direct CD 5. Overinstalling the software did not give any messages, but Direct CD would not work. After I uninstalled Direct CD and reinstalled the software everything worked fine. 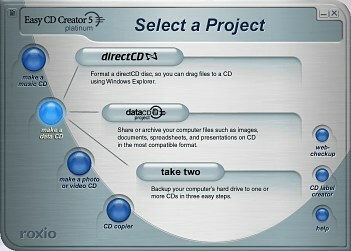 On my work PC I was running EZ CD Creator 4.0 and Direct CD 3.01. The installation detected this and told me to uninstall the old versions and re-boot my PC before installing the new version. The only problem I had was compatibility between the files written using Direct CD 5 and Direct CD 3.01 (this was before I upgraded both). The file names were always converted to uppercase, so when I transferred the files I had to rename them, using a converter like NameWiz. This is a new program that can convert between MP3, WMA, WAV and CD Audio tracks. It includes a 10 band equalizer, Reverb, a Realizer (to enhance treble when converting from MP3 files), a Normalizer (to ensure all audio tracks are at the same level), Spin Doctor (same application as before, to enable you to record from analog sources and remove unwanted clicks and scratches), a link to the CD Label Creator and a link to a Sound Editor program (for WAV files). The reviewers guide seems to contradict itself in describing the program. It is capable of recording directly from CD to CD, without wasting time of recording CD tracks to the hard drive then back out to a recordable CD. It says that some programs do this and save the CD tracks as MP3 or WMA files, and reduce the quality of the sound. It then states it has a unique feature for systems with only one CD drive. If you list tracks on a CD in your drive, and eject the CD to put in a recordable CD, the program quickly makes a temporary copy of the tracks in an uncompressed format so they are ready to record. In other words, if you have one drive, it will copy the tracks to the hard drive the same way it says that some programs waste time doing the same thing. If you save audio tracks in an uncompressed format like WAV, that's about 10Mb per minute as a stereo 16 bit 44Khz format. You still need a quick CD drive to generate these files digitally. The program can burn straight to CD, but only gives the time and space available on your hard disc, not the time and space taken by the tracks. If you are compiling an audio CD from different sources, you need to know how much space they will take to fit on a standard 74 minute CD (or the newer 80 minute ones). The effects are easy to use, and are applied in real time, so you can use the program to play MP3 files with the realizer on to enhance the sound. It can cause distortion when used with the Equalizer, and it is applied to all tracks to be converted. If you have a collection of CD audio and MP3 tracks, you must convert them separately if you want to apply effects to some of them. I'm not sure if my CD Writer is completely compatible with the software, as when I burnt a CD using SoundStream the tracks taken from an audio CD clicked when they were burnt onto a new CD. 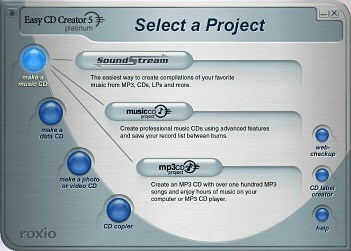 I could not use CD Creator software 4.0 with my CD Writer as it would eject the disc before completely burning the CD, rendering it useless, but with SoundStream, I had a different problem. Cutting a CD with the Disc At Once option, the program hung at the finalize CD stage. I rebooted the system and playing the CD on an audio player resulted in the clicks on the tracks. This program hasn't changed that much from the previous versions, except for the look. You can edit the track and artist names and if you select Disc At Once you can write CD Text discs. If you play these CDs in a compatible player, the track names and disc title will be displayed. When you create this type of disc with CDRWin, you have to create a text file and edit the information, and remember to edit another cue sheet to point to this file before burning your CD. The Music CD project makes it much easier to create these types of discs. You can preview your audio tracks before you burn them, and the preview player looks remarkably similar to the Microsoft Deluxe CD player that comes with the Windows 98 Plus pack. You can also apply a fade out and fade in for the tracks, selecting different types of crossfades and how long they take. Unfortunately, when I selected to fade one track out and start the next immediately (a common option), the second track actually starts 7-10 seconds into the next track number on the disc, and still with a two second gap of silence. Apart from the effect not working the way it was supposed to, the starting point of the next track seems to have been marked wrong on the disc. I often compile CD tracks for parties, and used to manually fade from one track to the next, recording everything to tape. Now I do this on CD, but with this feature I would not get the correct results. I have to mix the songs as one long WAV file using other audio software and mark the individual tracks as I burnt the CD. This works like a normal data CD, but only accepts MP3 files in the project. Burning a disc with MP3 files means you can have several hours worth of music on one disc. Many DVD players can play discs with MP3 files, so you can use it to play music for an entire evening. A unique feature of Easy CD Creator 5 Platinum is that you can write a playlist file (an m3u file) to determine the order the tracks are played. Software players like WinAmp will read these files and play the tracks in that order, but not all DVD players will. Some will play them in alphabetical order according to file name, or in the case of my Hitachi 505 DVD player, whatever order it likes, apparently! The only way I can determine the order is if I number the file names. Functionally the same as previous versions, allowing you to drag and drop files into the project area from an Explorer-like interface. You can import previous sessions (for multi-session CDs) and the software now supports 80 minute CDRs. Works the same as before, so you can drag and drop files onto a CD-RW disc like a floppy. There are some compatibility issues with discs using older versions of Direct CD as mentioned earlier, but apart from the grey metal and blue button interface (which is the same for all of the programs), it works the same. This is a very simple backup program that copies entire discs or partitions. There are no compression options, so when I selected one 9Mb drive, which was not even half full, it said that I would need 9 CDRs to backup the data. You can select individual files or folders to restore from, but you can use other programs like Norton's Ghost, which will back up the actual data on your disc using compression. An image of my main C drive takes 450Mb using Norton Ghost, which I could write to a CD with the software in case I need to recover from it. You can select individual files and it doesn't take 9 CDs! This program will save your pictures in an album and allow you to run a slide show with music in the background. You can add a title and description to each picture you import into your album, but you cannot display these in the slide show, which is a pity. The program didn't like long file names, converting them to the old dos 8.3 format. You can determine how long each picture is displayed during the slide show, and if you attach a WAV file, the pictures will automatically be spaced to fit to the length of the WAV file. With the lack of options it is easy to use, but like the Video Postcard program it would have been nice to have more control over the final production. If you want to make a more sophisticated presentation or store your pictures, you could use MultiMedia Builder or Kodak's PhotoCD. The Video Postcard is basically a wizard to take a template design as a backdrop to play a video on top of. 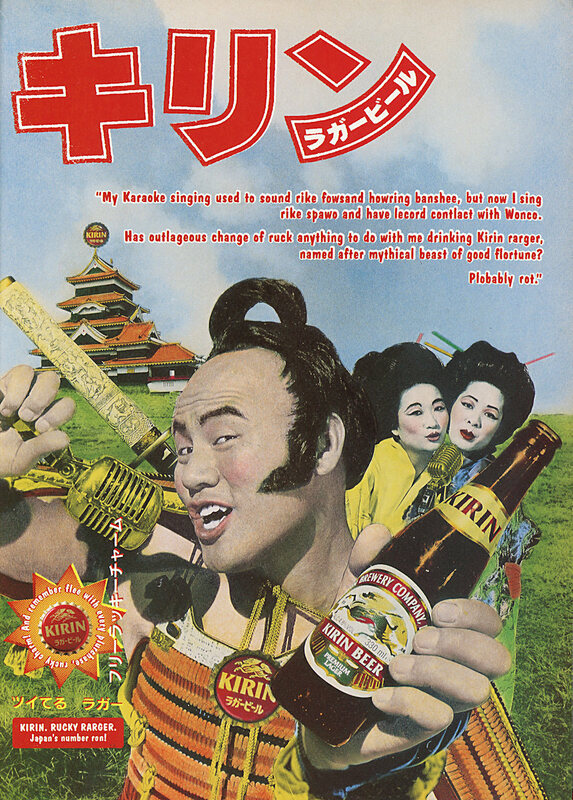 After the video clip has played, a postcard display with your text is shown. The whole production can be saved to disc or burnt to a CD. It is not meant for complex multimedia productions, and the selection of designs is limited. Both this and the Photo Album program are mention in one small paragraph in the manual, and you are told to refer to the online help for more information. This program does not seem to have changed since the version I had (or rather have, as the overinstall did not remove the old programs). The interface uses the Times Roman font, and you select the files you want on your Video CD. Unlike other CD Writer software, notable WinOnCD, this does not convert the MPEG files to the correct format (352x288 pixels, 25 frames per second with 44Khz stereo sound for a PAL Video CD format). In fact, the new version rejected some files which the old software accepted! These were video files taken from an existing Video CD, so I knew the format was correct. The reviewer's guide and manual suggest you create your videos using the Video Impression software, which will convert the files. There are menu and sequencing options available in the Video CD creator, but most of the time you would place all of the files to play in sequence. Most DVD players will read the files and play them in order, ignoring any menu system in the disc, and only older CD-i machines would actually display menus. This is simplified video editor that has a very confusing interface. I've used Ulead Media Studio, Adobe Premiere and MGI Video Wave, and these all have easy to use menus. The software includes a large range of still image templates to use in your productions, and you can add text and transitions as well. I tried to add some video captured using my ATI Radeon card, and it would not show the video when you played it from the editing page. You did get sound though. When I converted a large file to Video CD format, there was no indication of how long the program would take, or had taken. Now due to the way MPEG files are converted, this can only be an estimation, but MGI VideoWave and Ulead Media Studio both give a percentage/time estimation, which is constantly updated (with a preview picture as well), instead of Video Impression's plain processing percentage indicator which did not seem to move for at least five minutes. You can copy a CD from a CD with this, and the options of speed of the writer, how many copies, test, etc are standard. As with some of the other programs, there is a prevent buffer overrun option, which was greyed out. If your CD writer has this Burn Proof feature no doubt the option would be available, but it is not mentioned in the manual, and the Burn Proof logo on the back may give the impression that this feature is built into the software. Burn Proof enables the CD writer to check the data rate as it burns the CD. If the source (whether it is the hard disc or another CD ROM drive) cannot supply the destination (i.e. the CD your are burning) with the data quick enough, the writing process is paused until it can catch up. If your CD Writer does not have this feature, you need to prevent this from happening by either closing down all other programs when writing a disc, and/or reducing the write speed. It's the same program as with previous versions, with extra themes that you can download from the web site. All the text can be positioned on the outside cover, and curved text easily placed on the CD label. Fixed blue screen error some users experienced when adding removable hard drives in the Windows 2000 driver for T2. That's quite an array of bug fixes. There are also known problems with Windows 2000. Installing the software with the default settings can produce a blue screen of death after the reboot, and mean reinstalling the operating system. The web site says that this effects a small number of users, but this problem (caused by the Take Two software) was apparent in version 4 as well. There is a fix for this as well on the web site, but there has been a considerable amount of talk about this bug on newsgroups and web sites, like The Register, at http://www.theregister.co.uk/content/4/18803.html. The inconsistencies between the programs, with old looking and unintuitive interfaces, along with the bugs in the programs themselves means that this does give the impression of the best version of the software to date. 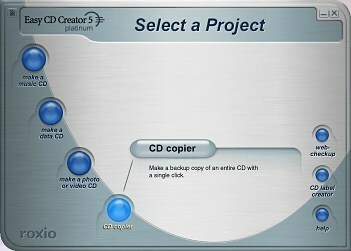 The EZ CD Creator application by itself is fine, and so is the CD Copier. Nearly ever CD Writer comes bundled with software these days, so you may not need to buy separate software. However, if you do, you could try Nero, WinOnCD or CDRWin for everyday use.